Esbelt belts for detergent last 2 times longer than rubber belts. Wide range of PVC and PU belts for varied applications. White PVC ESPOT 20CC, 30CC. Green PVC DRAGO 20CC, 30CC and 30CR. Thick PVC top cover, oil resistant. For loose pellets and humid, dry or hot powder. White PVC FEBOR 21CC & 31CC. Same as above but added abrasion resistance. For applications where return side has scrapers. Top cover PVC, bottom cover patterned PVC. For troughed conveying and metallic slider bed, e.g. conveying of bar soap. White PU CLINA 10UF, CLINA 12UF, CLINA 20UF. For straight and dry conveyors. 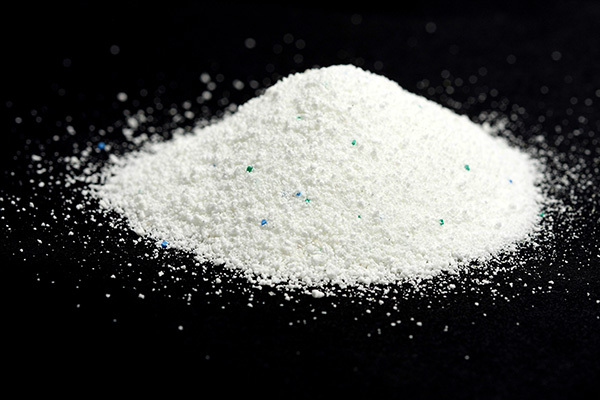 For soap cutters and nitrogen cooling and grinding of detergent powder. In esbelt, we have different types of belts for conveying detergents depending on the type of soap, whether in pellet, powder or bar form and the type of conveyor and production phase. For transporting packed products, we also have a wide variety of belts for the functions needed by the client.